In the first part of this tutorial, I introduced the basics and the Drools Guvnor, as well as demonstrated the creation of a simple rule in Guvnor. The objective of this part is to show how to consume the rule set, as well as present as expose it as web service. Where the field config is the configuration of the API (to be explained), the field factName represents the fully qualified name of the POJO that will be used as fact (in our example, is seguradora.Segurado) factValues is a map that will be used to populate fields and the fact expectedResultsMap is a map that will be used to retrieve the desired values of the implementation of the rule (in our case, the status field is interesting). localCacheDir: directory will be cached remotely read the rule. Using Drools Server, placing a file. properties (similar to the properties file passed as parameter to the client) in the “WEB-INF/classes” Application of Drools Server. In this way, however, the web service will be exposed as REST. The downloads page , is available for download the client’s consumption and exposure rule as SOAP web service. 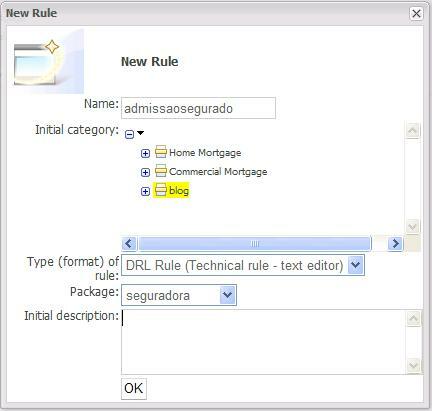 The next part will present how to perform deploy a rule dynamically. A SOA well done should be developed along the lines of business for which the architecture is being developed. One example is an insurer, where the services may well be made for each sector of insurance offered, as well as a customer base. Thus, if the insurer will act in a new class of insurance, all she has to do is to reuse the customer service, to offer these new portfolios. However (and still using the example of insurance companies) should be noted that the selection of new users must abide by certain rules (eg, an insured can not be less than eighteen years), it should also be noted that these rules are not always immutable (and if the insurer decides that insured below eighteen years may be accepted only in life insurance, what if, during the operation of the system, the system user decides that insured under eighteen years can only be accepted with parental consent?). To reflect this flexibility, the architecture SOA takes the concept of Business Rules. Are rules that are usually understandable by business analysts and can be easily changed. Some engines expose those rules in the form of web services and other options to facilitate the relaxation of such. Some also facilitate hot deploy rules to allow this flexibility. To illustrate this concept of + hot deploy rules, created this tutorial on how to develop rules from the Drools API, post them on JBoss Guvnor and eat them so performative. Why exemplify using Drools Guvnor + (or JBoss BRMS)? 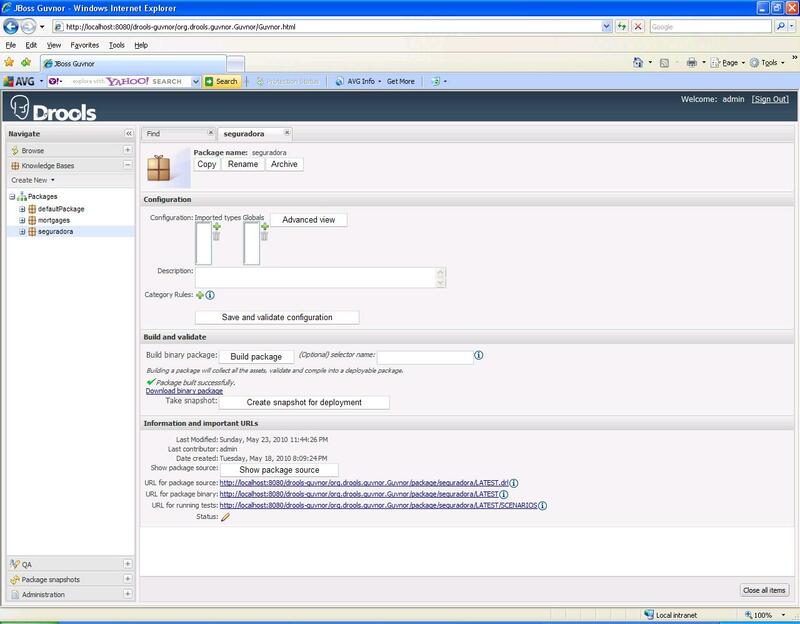 The JBoss Guvnor is a system of governance rules that open source has an extremely user-friendly management interface. Also, your engine has, so native systems that facilitate the hot deploy and manage these rules natively through Apache Jackrabbit . What terms need to know when using Drools? Package: logical organization to hold a collection of rules (similar to packages of Java classes). Model: entity that will store the data input and output rules. Fact finding that will cause a rule to run (similar to a if, in Java). Rule: snippet of code that, given certain facts, it will run. Snapshot: compiling the package at some point, which is what effectively will be used to generate a new snapshot (ie, is a “snapshot” of the package). 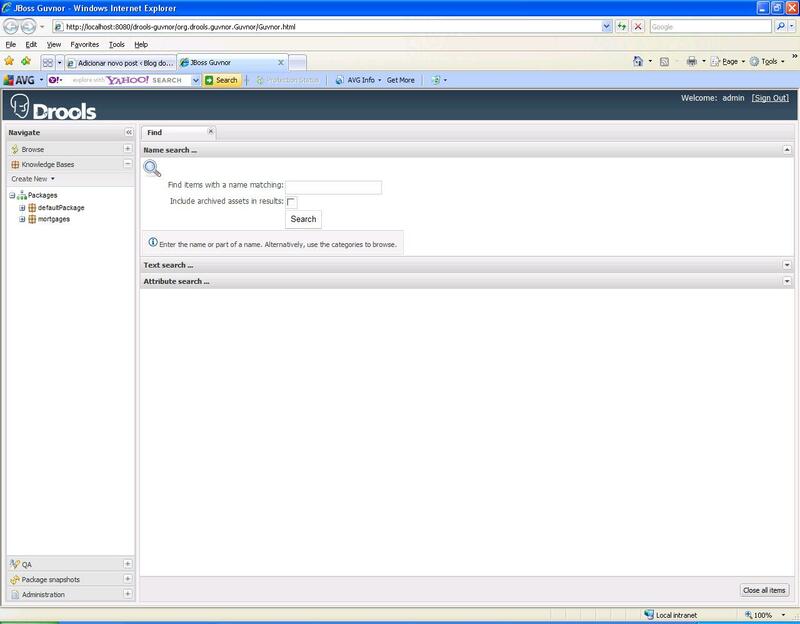 This tutorial is based on version 5.0 of Guvnor, based on JBoss AS version 4.2.3. The set is available for download here . How do I create a rule using Drools? rule "menores de idade não são autorizados"
will be evaluated. Note that here it is developed purely in Java code, or ceases to be native to the Drools. The written text box that appears, type the text of the rule. There, the rule is set to deploy. For the implementation of the rule, however, you must perform some coding, I’ll post next post. See you there!